I told you I would be back. Thank you to my sister-in-law, Joyce, at From This Side of the Pond for nudging me today or I otherwise might not have made it. 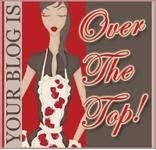 She gave me my very first blog award today...Thank you Joyce! Along with the award came a one-word challenge. I am supposed to answer the questions below and pass along the award to some Over the Top Bloggers who haven't participated in this little game. One problem for me: I can't say anything with only one word. Really. It's hard. I think you need to know more than just one word of my thoughts on things. But here goes my attempt. I'll keep my answers as short as I can. 1.Where is your cell phone? In my back pocket. I know, not so feminine, but I lose it if I keep it anywhere else. 2. Your hair? Thick, coarse, unruly, but bows down with respect to my flat iron. 17. Where did you grow up? East Tennessee, y'all! 18. Last thing thing you did? Partially started dinner, helped the boys with their homework, read Joyce's blog, ate a bowl of pudding...all at the same time! So now, it's your turn. If you wanna play along, cut & paste these questions on your blog or facebook and give us what you got. Let me know your in by commenting below. I enjoy your blogs and your friendship so much. You ladies are OVER THE TOP! thanks! i love getting tagged. i've done this one twice already, but it did not come with the award, so thank you. and this was a fun one to do. i'll have just as much fun doing it a third time! Hey, thanks for including me. I tried to copy and paste but it just will not work for me. If I find the time to retype everything, I will answer the questions.